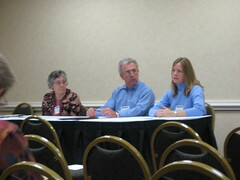 Margaret Donovan from the Cary Memorial Library in Lexington, MA, Edward McDermott of Goddard Library at Clark University, Don Richardson from Worcester Polytechnic Institute, and Laurie Welling, Assumption College Library, all in Worcester, MA, discuss their experiences, good and bad, taking on the positions of System Librarian at public and academic libraries. Find out how they deal with the many day-to-day varied situations of their jobs, and who they need to involve to keep the systems functioning smoothly. Technology Culture is important in the library – staff should understand available tools. Libraries also have staff-only tools (mp3 players, digital cameras, etc. ), to borrow, use and learn. The best way to create a technology culture is to rewrite job descriptions to include tech skills, and make sure new employees are qualified and comfortable in all aspects of librarianship. What software do you use for statistics? How do you manage unfreezing to do updates? Do you create and update websites? CML: There is a web team (2 people) who do most of the content, but there is supposed to be more. I do mostly thr tech support. How is a good number for a web team? WPI: We found 9 is too many, so pared it back to 6. Everyone knows basic HTML and has different areas of the site they maintain. Do you implement technology competencies? How about patron training at different skill levels? How does network tech support work with individual libraries? What about tech support coverage when you’re not there, and how many hours a week are you open? CML: We have almost complete coverage, but there is always plan B: hang an “out of order” sign, and it can wait until tomorrow. But we do get calls/emails at home. What about your professional development? How do you document your job for your replacement? Do you have digital microfilm equipment (scan to pdf, email, etc)? How much time do you spend helping patrons with computer questions? CML: Maybe six times a week. Staff is good at calling me only in real emergencies. Also have to manage expectations, and not go above and beyond in every single situation. What elevel of access do staff have to their machines? CML: Most are powerusers (web people are local admins), and no one knows admin passwords on public computers. To do this, you need authority from above, and also the credibility for staff and patrons to believe you. We crack down a bit on non-work use (changing wallpaper, online shopping, etc), because these aren’t the staffs personal computers, they are the library’s computer (those are the people that usually end up with spyware and slow computers).